U.S. Facing Global Diplomatic Crisis Following Massive WikiLeaks Release of Secret Diplomatic Cables | Democracy Now! writes the Media Fix blog for The Nation. He was the longtime editor of Editor & Publisher magazine and is the author of 10 books, including The Campaign of the Century: Upton Sinclair’s Race for Governor of California and the Birth of Media Politics. professor of political science at California State University, Stanislaus and visiting professor at UC Berkeley. He’s the author of The Battle for Saudi Arabia and runs the Angry Arab News Service blog. 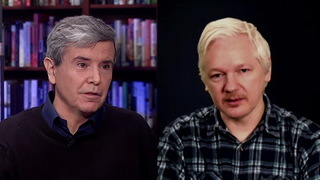 StoryApr 10, 2017Julian Assange vs. Allan Nairn: Is Donald Trump a Unique Danger to America? AMY GOODMAN: The whistleblowing website WikiLeaks has begun releasing a giant trove of confidential American diplomatic cables that’s sending shockwaves through the global diplomatic establishment. The more than a quarter of a million classified cables were sent by U.S. embassies around the world, most of them in the past three years. WikiLeaks provided the documents to five newspapers in advance: the New York Times, the London Guardian, Germany’s Der Spiegel, France’s Le Monde, and Spain’s El País. The revelations in the cables are extensive and varied. Among the findings, Arab leaders are privately urging the United States to conduct air strikes on Iran. In particular, King Abdullah of Saudi Arabia has repeatedly called on the U.S. to attack Iran to destroy its nuclear program, reportedly calling on American officials to “cut off the head of the snake.” Jordan, Bahrain, the United Arab Emirates also said they support a U.S. attack. The cables also highlight Israel’s anxiety to preserve its regional nuclear monopoly, its readiness to “go it alone” against Iran, and its attempts to influence American policy. The cables also name Saudi donors as the biggest financiers of Sunni militant groups like al-Qaeda. The cables also reveal that U.S. officials sharply warned Germany in 2007 not to enforce arrest warrants for CIA officers involved in an operation in which an innocent German citizen with the same name as a suspected militant was abducted and held for months in Afghanistan. The cables also document suspicions of corruption in the Afghan government. One cable alleges that Afghan vice president Zia Massoud was carrying $52 million in cash when he was stopped during a visit to the United Arab Emirates. For more, I’m joined for this hour by four guests. Carne Ross is with us. He’s a British diplomat for 15 years who resigned before the Iraq war. He’s the founder and head of a nonprofit diplomatic advisory group, Independent Diplomat. He is joining me here in New York in our studios, along with Greg Mitchell, who writes the “Media Fix” blog for The Nation, and before that was the longtime editor of Editor & Publisher magazine. Joining me via Democracy Now! video stream is Dan Ellsberg, perhaps the country’s most famous whistleblower. He leaked the Pentagon Papers in 1971. We’re also joined by As’ad AbuKhalil, a professor of political science at California State University, Stanislaus, and visiting professor at UC Berkeley. He’s the author of The Battle for Saudi Arabia and runs the “Angry Arab News Server” blog. Dan Ellsberg, we’re going to begin with you. We were talking to you on October 22 on Democracy Now!, when you were headed to London to participate in the WikiLeaks news conference on the release of close to 400,000 documents. What are your thoughts today? DANIEL ELLSBERG: Well, this is totally a process, and this stage of the process has just begun. It’s going to go on day after day after day. We’ve seen one out of a thousand so far of the cables that WikiLeaks is prepared to release. So it’s very early to judge, really, the value or the dangers, if any, of releasing that. Back in October, when we were releasing — when he was releasing the — I think it was the Afghan documents at that point, they were still new to the process and, I think, made some mistakes in terms of releasing some names that they shouldn’t have released at that point and were properly criticized for that. As a result, it appears that the last batch before this one was redacted fairly heavily by Assange, by WikiLeaks, with the result that when the Pentagon said that there were 300 names that were endangered by that release, they said right away, based on their own files and their own knowledge of the cables, it turned out within a couple of days that WikiLeaks had released none of those names, that none of — those had all been redacted, and they were all not endangered. The upshot right now appears to be that, as of now, with the hundreds of thousands of documents that WikiLeaks has put out, the Pentagon has had to acknowledge that not one single informant or soldier has been endangered. In fact, they haven’t even felt the need to protect one or to inform one that he or she was in danger. So, that risk, which we’re hearing again now, right now, has obviously been very largely overblown and is a lot of blather. AMY GOODMAN: Greg Mitchell, you’ve been tweeting this since it came out yesterday, 1:30 in the afternoon on Sunday Eastern Standard Time, the beginning of the release of the documents. First of all, talk about their significance, what they are. What are the different places they are from? GREG MITCHELL: Well, they’re from 79 different embassies from around the world, so it really, of course, is quite unprecedented. And as Dan said, the way this is different from the previous WikiLeaks, when they came out on the Iraq war and on Afghanistan, those were basically one-day stories. They were gigantic document dumps, got massive media coverage for a day or so, and then it was pretty much over. This is going to be emerging over the next nine days, for example, in the New York Times, and WikiLeaks on their own site has said it’s going to go on for months. So it is a little early to say exactly what — you know, what the effects are going to be, what the downside might be, and the revelations are already quite significant. And we’re already seeing some of the outlets are summarizing some of the revelations yet to come. So when you read even some of the things you read at the top of the hour, they actually are not cables that have been released yet, but some of the media outlets are kind of previewing what’s coming. AMY GOODMAN: Interestingly, there is a file on BitTorrent, in case the full release doesn’t go forward for some reason. The file is encrypted, but all that’s needed to decrypt it is a pass phrase, which will be released in the worst-case scenario. GREG MITCHELL: Right. What’s also different about this release is that even in the previous leaks, WikiLeaks did work closely with news organizations. But here they gave the news organizations these files very early on, and the news organizations have to the — at least the _New York Times has gone to the administration, has run names past the State Department, and has redacted many of the documents, which then WikiLeaks has then taken redacted documents, and these are among the over 200 they’ve already posted. So, in a sense, WikiLeaks is letting the news media help them in making sure these documents are safe. So I would imagine that as they emerge, there’s going to be even fewer worries about what might be in them than might have been in the past. AMY GOODMAN: We’re going to break and then come back to this discussion for the hour. This is Democracy Now!, democracynow.org, The War and Peace Report. Back in a minute. AMY GOODMAN: Admiral Mike Mullen, the chair of the Joint Chiefs of Staff, who has previously accused WikiLeaks of having blood on its hands, was on CNN’s GPS on Sunday. This was his response when host Fareed Zakaria asked him if WikiLeaks’ latest document release endangers American troops. ADM. MIKE MULLEN: Absolutely. Not just American troops, but it also endangers the lives of other individuals that we have engaged in our — in our overall efforts, whether they be in Afghanistan or other countries. So I think it’s a very, very dangerous precedent. What I don’t think those who are in charge of WikiLeaks understand is we live in a world where just a little bitty piece of information can be added to a network of information and really open up an understanding that just wasn’t there before. So it continues to be extremely dangerous, and I would hope that those who are responsible for this would at some point in time think about the responsibility they have for lives that they’re exposing and the potential that’s there and stop leaking this information. AMY GOODMAN: That’s Admiral Mike Mullen. Dan Ellsberg, your response? DANIEL ELLSBERG: You know, the process — first of all, we have Admiral Mullen there, who is in the interesting position of sending American troops, men and women, into harm’s way. So when it comes to blood on hands, he’s really got a lot to answer for. From another point of view, he’s quite an expert on that. At the same time, you have to realize that he has almost unlimited resources on his side to minimize that damage by assigning people to find out who is in danger in these documents — he’s had months and months to look at them — and how to protect them. His command in Kabul has reported that they have not felt it necessary to protect or inform an individual, nor has any individual been harmed. And you can believe that if their plumbers operation, to the tune of more than a hundred men working on this, had been able to find one mutilated body, that one would be on the cover of Newsweek by now. So we’ve had a pretty good test of how well the process of sanitizing these documents by the newspapers, and by WikiLeaks, has operated, and the answer is: the proof is in the pudding. No harm has been done. Admiral Mullen’s fears are groundless. AMY GOODMAN: Carne Ross, you were a British diplomat for 15 years. You resigned before the Iraq war. You now have founded and are head of a nonprofit diplomatic advisory group called Independent Diplomat. These are diplomatic cables. Talk about the significance of what they are and the fact that they’ve been exposed and what you found the most interesting. CARNE ROSS: Well, I think this is an extraordinary and colossal event that will have a profound effect on the discourse, the practice, of diplomacy. I don’t think it’s at all clear that one can say they’ve not caused harm or have caused harm. This will have effects. There will probably be good effects, and there will probably be bad effects, when this amount of information is dumped into the public sphere, information that was hitherto confidential. This will have political and perhaps security effects, as well. What this means is I think it will be very difficult for American diplomats henceforward to practice diplomacy. I think the fact that these cables have come out will mean that people — other diplomats will find it harder to share confidences with American diplomats. It also, I suspect, will mean that diplomats, American diplomats, will forebear from putting the most sensitive and juicy material into telegrams, or at least those telegrams will be given a much narrower distribution than they have hitherto. That will have, of course, negative effects for the operational effectiveness of the U.S. government, and perhaps also for the WikiLeaks and historians of the future who want to find out what the U.S. government and its diplomats were actually doing or thinking. So I think this will be very, very significant in the long term. It will ramify in all sorts of different ways. AMY GOODMAN: In the United States, the mainstream media is basically just talking about the ways this will damage the United States, yet you, a British diplomat, are saying this could be beneficial. Why? AMY GOODMAN: And you testified. CARNE ROSS: I did. I’ve testified twice at two official inquiries. AMY GOODMAN: And presented information about weapons of mass destruction. CARNE ROSS: Yes. And when I first presented it, I was attacked by my government. And now what I said is more or less accepted as, you know, the understood truth of what happened, you know, that the government did not tell the truth about WMD, that it ignored available alternatives to war. The trouble with all of this is we tend to place government in this sort of superior, elite position, that they know things that we do not know, that governments are entitled to know things that the public do not know. I think the balance is way too far in the government’s favor. Far more information should be released and made transparent. I’m not sure, however, that the way WikiLeaks has done this is the right way. This is a very random, blunt instrument to attack the problem of the lack of transparency of government. This should ideally be done through the mechanisms of democratic accountability. Of course, it’s not been done that way so far, hence WikiLeaks. AMY GOODMAN: Talk about Yemen, the revelations around Yemen. CARNE ROSS: In Sana’a, there will be very, very many unhappy people in the government right now. The telegram recording General Petraeus’s conversation with President Saleh is hugely damaging to the government of Yemen, in that it makes clear that U.S. aircraft and UAVs are carrying out strikes inside Yemen against al-Qaeda, militants perhaps — we don’t really know who they are — but the Yemeni government is claiming these strikes as its own. The fact that the U.S. is doing this — and this has now been confirmed. Many people speculated that this was the case, because Yemen didn’t itself have this capability, but the fact that this is now confirmed in writing is enormously damaging to the Yemen government. AMY GOODMAN: And you have the Yemeni vice president saying that he then lied to his parliament about this, as well. CARNE ROSS: Yes. Yemen is not exactly a perfect democracy, to say the least, so whether the fact that he lied to his parliament is a major revelation or not, I leave to others to judge. But the fact that U.S. air strikes are confirmed inside the country will enormously increase the pressure on the Yemeni government. That’s just one of the many, many ways that these telegrams, the release of these telegrams, will ramify, frankly, in unpredictable ways. CARNE ROSS: Well, from Clinton to Rice, actually. Secretary of State Clinton to Ambassador Rice at the U.N., I think they are [inaudible], yes, yes. CARNE ROSS: Well, this is a standard instruction telegram from Washington to USG. All of these telegrams are signed off “Clinton.” This shouldn’t be seen as a sort of personal message by Hillary Clinton. All instruction telegrams from Washington will be signed off with the name of the Secretary of State, so that’s not a very big deal. What this telegram sets out is a long list of intelligence requirements for the U.S. at the U.N., which is, frankly, an extremely exhaustive list, right down to sort of the activities of NGOs in preventing AIDS or affecting the policies of the U.N. So it’s a very, very comprehensive list. The fact that the U.S. is trying to gather intelligence information at the U.N., frankly, is not a very big revelation. I mean, everybody is spying on everybody else at the U.N., including on Secretary-General Ban Ki-moon. The British Development Secretary Clare Short, who also resigned over the Iraq war, has said publicly that the U.K. authorities were bugging the phones of Kofi Annan when he was Secretary-General. So I don’t think that this will come as a great revelation to people at the U.N. It will, however, be rather embarrassing for U.S. diplomats currently practicing at the U.N.
AMY GOODMAN: But let’s really talk specifically, for people who are waking up this morning, did not hear anything about this, the kind of spying they’re talking about. I’m looking at The Guardian, one of the participants in the WikiLeaks release. Washington “running a secret intelligence campaign targeted at the leadership of the United Nations,” including Secretary-General Ban Ki-Moon and the permanent Security Council representatives from China, Russia, France, and the U.K. The classified directive, which appears to blur the line between diplomacy and spying, was issued to U.S. diplomats under Hillary Clinton’s name in July 2009, demanding forensic technical details about the communications systems used by top U.N. officials, including passwords and personal encryption keys used in private and commercial networks for official communications. It called for detailed biometric information on key U.N. officials to include undersecretaries, heads of specialized agencies and their chief advisers, top SYG — that’s secretary-general — aides, heads of peace operations and political field missions, including force commanders, as well as intelligence on Ban’s management and decision-making style and his influence on the secretariat. A parallel intelligence directive sent to diplomats in the Democratic Republic of Congo, Uganda, Rwanda, Burundi, and biometric data, including DNA, fingerprints and iris scans. CARNE ROSS: Yes, such is the nature of modern intelligence gathering. But the fact that the U.S. has this list of intelligence requirements at the U.N. I don’t think will be any great surprise. And the fact that the U.N. — The Guardian claims this is an enormous revelation seems to me rather a pretense at The Guardian. We’re not babes in the woods. States spy on each other. They’re going to spy on the U.N. What the Secretary-General and his senior officials say is of interest to states, so they’re going to do that. AMY GOODMAN: I mean, this does include cables from the former Secretary of State Condoleezza Rice from Hillary Clinton, Republicans and Democrats alike. AMY GOODMAN: So a diplomat in another country who invites an ambassador, a president, to the U.S. embassy for tea, then that president is wondering if when they drink that tea their DNA is going to be taken. CARNE ROSS: Well, that’s a new twist on the whole intelligence thing, I agree, and it is rather extraordinary. I can’t quite, myself, see how your saliva on a coffee cup is going help you learn the intentions of the U.N. or the government of X country, X, Y, Z. It’s a rather extraordinary thing, and I’d be interested to find out how, in fact, that process works. But the fact that the U.S. is collecting this data, I don’t think we should all be surprised about this. AMY GOODMAN: Well, you’re a diplomat. I think people in the public would be rather surprised. But, Greg Mitchell, what is your take on this? AMY GOODMAN: They just stuck with the iris scans. AMY GOODMAN: Didn’t emphasize the fingerprints and the biometric data. GREG MITCHELL: Right. It’s hard for me to believe that the long list of this is not something that is new, the full extent of it. And as someone pointed out, even if it’s not that shocking, it must be exhausting asking these diplomats around the world to do this work instead of the important work they’re supposed to be doing. They have a, you know, long checklist to go through on what they’re supposed to do to contribute to this intelligence gathering. AMY GOODMAN: I wanted to bring in As’ad AbuKhalil into this conversation, professor of political science at California State University, Stanislaus, visiting professor at UC Berkeley. He’s the author of the book The Battle for Saudi Arabia, which is what I want to go to right now, the diplomatic cables around Saudi Arabia calling for the attacking of Iran. Can you summarize what the cables said, and then your response? AS’AD ABUKHALIL: Well, I mean, much of the cables about Saudi Arabia shows a very high degree of control by the U.S. government over the policy decisions made in Saudi Arabia. I mean, at one point, there is an American specific request, issuing what reads like command, asking the Saudi government to go to China and to undertake a certain mission on behalf of the United States vis-à-vis the situation in Iran. And I think that the extent to which the Saudi government and all Arab governments in the Gulf are embarrassed by these leaks is evidenced by the clampdown that is being exhibited throughout the Saudi-controlled Arab media and even the so-called independent Al Jazeera, which is, contrary to its reputation here in the West, is the most serious news organization in the Middle East, is also trying to cover up the embarrassing revelations about the way Arab governments operate vis-à-vis the United States. And you have to take into consideration that much of the discussions and the utterances and statements that are made by Arab leaders at the highest level in these documents are in direct contradiction with their public declared policies that are made in Arabic to their people. AMY GOODMAN: I wanted to ask, As’ad AbuKhalil, if you can go a little closer to your computer so we can hear you more clearly. As’ad AbuKhalil, again, is a professor visiting at UC Berkeley. He’s the author of The Battle for Saudi Arabia and runs the “Angry Arab News Service” blog. If you could now continue with exactly what was said by Saudi Arabia in conversation with who in the United States? AS’AD ABUKHALIL: Well, I mean, there’s more than one conversation that’s revealed in those documents. I mean, I’ve read all those pertaining to the Middle East authorities on the various websites and so on. I mean, for example, there is one discussion conducted between the King of Saudi Arabia, who rarely has these kinds of discussions with even his counterparts in the region. But he is willing to meet with a relatively lower-ranking official, say, of Department of Homeland Security. And the discussion goes on about a variety of issues related to what is of interest to the American government. What is very striking to me, for example, take the issue of human rights. I read what was released yesterday, and I am not struck, really, that the U.S. government does not bring up human rights, except in one meeting between American congressional delegation and the Syrian president. And at one point, the Syrian president told them, I mean, what amounts to “What about Saudi Arabia?” Because in a meeting between an American official from Homeland Security and the Saudi King, not only does that American official not bring up the human rights violation in the most oppressive government, bar none, in the entire region — and that’s Saudi Arabia — but he even goes on, on behalf of the U.S. government, to praise the King for the human rights improvement and reforms, ostensibly reforms, that have been going on in that kingdom. You also see, for example, in the same meeting, the Saudi King brings up the issue of the various restrictions on travelers from Saudi Arabia into the United States. And the King asks him that it’s very embarrassing to him, before friends and foes alike, because it gives the impression that United States and Saudi Arabia are not that close as allies. And of course the American official goes on to underline the extent to which the two countries are very close to each other. What is very striking about all these documents on the Middle East is that the Arab people are not going to be surprised that much. They all along have known that they are ruled by a bunch of liars and deceivers who go to extra lengths to appease and please the United States. What is going to be particularly revealing are the details, the lengths to which these rulers go in order to please the United States. And we find that they are not capable of making independent decisions. Whatever the instincts of the United States are, those rulers go along with them. And, in fact, they seem to compete with one another, for example, in showing how much they are hostile to Iran. And you see, for example, the second person in the United Arab Emirates, a guy who is very influential there, goes on to encourage the United States not only to attack Iran in a variety of sites, but to prepare for a land invasion. I should also say, what is revealing in those documents also is the utter stupidity of those rulers, who, in many of these conversations, seem to think that the United States government really listen to their advice, that they really consult with them on a regular basis, and as if they are waiting for the opinion of the Egyptian president or the Saudi King before they reach their decisions. And I think they seem to want to flatter themselves, because the kind of relationship between these protectorates — and I call them protectorates because that’s what they were, say, in the era of the British Empire, and it seems they have not advanced that much in approaching a level of sovereignty that is characterized membership in the United Nations. And on the question of Israel, what people are going to notice is the extent to which there is a close coordination between the Israeli government and the American government on all issues pertaining to the Middle East, including Pakistan, and the extent to which that kind of coordination is absent in these discussions between the American officials and the Israelis. I should also say that we have seen documents in which the opinions of the head of the Mossad, Dagan, were detailed by an American — in an American cable. And it is also striking the extent to which the head of the Mossad, highly touted organization, does not seem to have that many insights or information or analysis that is insightful about what’s happening in the Middle East. Certainly, the location of Israel is extremely high in the esteem of the United States, but the low esteem to which the Arab governments are held by U.S. officials is quite apparent in these documents. AMY GOODMAN: In particular, King Abdullah of Saudi Arabia, repeatedly calling on the U.S. to attack Iran, to destroy its nuclear program, reportedly calling on American officials to “cut off the head of the snake,” he now, the King, actually is in New York, is that right, for back surgery? AS’AD ABUKHALIL: Right. He’s going to be there for a few weeks, and I think he will be able to see what his media is not showing: the extent to which these revelations are dominating international media. And I should also add, the extent to which they are dominating the underground media or the new media of the Middle East — Twitter and Facebook. All of them are discussing, from the Arab world, what is happening, and many of them are commenting about the irony. Yesterday, the main Saudi news organization, Arabiya, kept promising viewers that the leak of the documents is imminent, from ten minutes from now, we’re going to see all these documents. And then once the documents are out, there was complete silence in that news organization. They figured that all these documentations are, in fact, an utter embarrassment to the image of their ruler that they try so hard to prop up in the eyes of the public. I think the Arab public today woke up wiser than before, more cynical than before, and certainly more critical of the government. You see all these governments competing, trying to bring up the issue of Iranian nuclear weapons. Not a single Arab leader in those discussions brought up the issue of the massive Israeli WMD program that has been going on for decades, because they don’t dare bring it up. AMY GOODMAN: As’ad AbuKhalil teaches at University of California, Berkeley. We are talking about this massive WikiLeaks leak, up to 250,000 documents being released over the next few weeks. We’re going to break and then come back to this discussion. This is Democracy Now!, democracynow.org, The War and Peace Report. Back in a minute. AMY GOODMAN: We’re continuing on this historic release, unprecedented release, of diplomatic cables that’s happening over the next weeks or months, the total believed to be over 250,000. It’s been released by WikiLeaks, the whistleblower website. My guests for the hour are Dan Ellsberg, who is the premier whistleblower in the United States, released the Pentagon Papers some, oh, what, 39 years ago, 40 years ago. He worked, a high-level official in the Pentagon. He had top security clearance, which is how he got these documents, also worked for the RAND Corporation. We’re also joined by As’ad AbuKhalil, a professor from University of California system. Greg Mitchell is with us from The Nation magazine. And we’re also joined by Carne Ross. Carne Ross is a former British diplomat who quit over the Iraq war. Dan Ellsberg, I wanted to go back to you to get you to comment on Democratic Senator John Kerry’s comments on WikiLeaks. The chair of the Foreign Relations Committee called the release reckless and said, quote, “This is not an academic exercise about freedom of information and it is not akin to the release of the Pentagon Papers, which involved an analysis aimed at saving American lives and exposing government deception. Instead, these sensitive cables contain candid assessments and analysis of ongoing matters and they should remain confidential to protect the ability of the government to conduct lawful business with the private candor that’s vital to effective diplomacy.” Dan Ellsberg, your response? DANIEL ELLSBERG: Oh, blah. Senator Kerry is still reeling, I’m afraid, from the battery he got from the Swift Boat liars who were said to have said at the time, “When we get through with John Kerry, people won’t know which side he fought on in Vietnam.” They took a war hero and made him into a hoax, basically, and he’s been trying to establish his macho credentials ever since. It’s not his finest hour to say silly things such as the quote you just described. Let me put, though, these papers in some perspective. Most of your people, except for Carne Ross, to some extent John Kerry, are really not familiar with the levels of classification here, and a lot of silly things have been said about them, ignorantly. The fact is that these are quite low-level documents. They’re equivalent to the fields-level documents on the civilian side that we saw in the Afghan and Iraq documents that WikiLeaks earlier released. So they’re not the Pentagon Papers in terms of top-secret, high-level decision-making papers. When the Times hypes its documents, or the other papers, as being prepared for high-level policymakers, that’s just false. Probably no high-level policymaker even saw one of these secret documents. And I’ll give you one piece of background on that. When I worked for an assistant secretary of defense in 1964, '65, on Vietnam alone, I wanted to inform him as to what he ought to look at in the course of his day, in the way of these very same cables from — just from Vietnam alone. And I asked for the whole take, the whole set of cables of all kinds from that area. So I came into my office in the morning, and I find as high as my head, five-and-a-half-feet high — I was just a couple of inches higher than that — two volumes of paper, two piles of paper, for me to look at. I couldn’t even whip through it into the burn bag without reading most of that stuff. So I had to give the directive, “Cut out the secret documents, leave me only those that are “no dis,” “ext dis,” “lim dis” — that’s limited distribution — or “eyes only” and top-secret or higher. And that cut me down to two piles, each two-and-a-half-feet high, or five feet of paper instead of eleven feet of paper. In short, what I'm reading in this — and it’s very familiar to me from my days in Vietnam when I wrote this sort of cable and sent it out from Vietnam back to Washington — what we’re reading is the sort of thing that I in Washington didn’t have time to read. It just wasn’t important. So I think you can say that probably no assistant secretary or Hillary Clinton ever laid eyes on any of these cables. They’re not, for example, the Eikenberry cable, which was genuinely very revealing, that was given to the New YorkTimes from our general in Kabul, that revealed his opinion that General McChrystal’s program, which Obama actually followed, was hopeless and counterproductive and would in no way improve the situation. Now, that cable was only secret, but it was “no dis,” and it had a codeword. That meant it was very carefully closed. It was the sort of thing I would have seen if I had been in the Pentagon, as a “no dis” cable. In short, we’re not seeing high-level decision-making paper. For what it’s worth, we are finding that the big problem with our awful, miserable, incompetent foreign policy in Iraq and Afghanistan is not the fault of foolish, stupid or lying middle-level staffers down below. They’re speaking fairly honestly, not with a lot of local knowledge often, but fairly shrewdly in many cases, doing their best job to their superiors. The lying, as in Vietnam, is being enforced by the upper levels. What we need to see, really, is someone following Bradley Manning, or whoever the source is, following his example. He gave what he could, at his 22-year-old’s level, corporal’s level, what was available to him, to inform the public. We need somebody with higher access, the kind I had at that time and unfortunately didn’t use then, I’m sorry to say. I apologize. But somebody to put out the higher-level papers that reveal the high-level dealing and stupid formulations, theories, mad man theories and others that are informing our policy, so that the American people can begin to get some grip on our incoherent policy and enforce a more humane and productive thrust to it. AMY GOODMAN: Our former British diplomat in studio here, Carne Ross, is shaking his head. CARNE ROSS: I have to disagree with Daniel Ellsberg. I mean, the telegrams that I’ve seen, including the secret classified stuff, is the meat and drink of diplomacy. My foreign secretary read this stuff every day, a thick folder of it, as I did in the Foreign Office. I don’t know how things work in the U.S. government, but my experience working on Iraq is that the top-secret stuff, the intelligence-based stuff, is the least accurate form of reporting that you get. What foreign leaders are saying to American diplomats or British diplomats in confidential discussions is enormously important. Records of what King Abdullah said or President Saleh of Yemen said would be of great interest to senior officials in the State Department, or indeed the NSC or the White House, so I have to disagree with Daniel Ellsberg’s analysis. This stuff is very, very revealing of the everyday meat and drink of American diplomacy. Greg Mitchell, the significance of other leaks that have come out in this trove of documents, on how the hacker attacks, which forced Google to quit China in January, were orchestrated by a senior member of the Politburo who typed his own name into the global version of the search engine and found articles criticizing him personally, but what China did with Google’s information? GREG MITCHELL: Joe Lieberman just is the most recent one, quite a detailed call, saying this is a national security threat. Peter King said it was the same thing as a military attack, likening it to an attack on the U.S. But so far that hasn’t gotten anywhere, and there hasn’t been a serious move to prevent the further dissemination or to stop, as we saw with the Pentagon Papers, the actual print newspapers printing documents. So we haven’t seen that yet, but we have seen some elegant defenses of publishing the documents, particularly in The Guardian, Simon Jenkins and others there, and in the New York Times note on why they published the documents, and they emphasize that it’s not the press’s role to keep the government from suffering embarrassment. And they also — as he mentioned earlier, the importance of using the example of the false information that was spread about Iraqi WMDs, that if material like this had come out at that time, it would have had a tremendous impact on perhaps halting what became the invasion of Iraq. AMY GOODMAN: I wanted to talk about Bradley Manning for a minute. The U.S. military believes the leak can be traced to Private First Class Bradley Manning, who’s been held in solitary confinement for the last seven months and is facing a court-martial next year. In an online conversation with computer hacker Adrian Lamo, who would later turn him in, Manning said, quote, “Hillary Clinton and several thousand diplomats around the world are going to have a heart attack when they wake up one morning and find an entire repository of classified foreign policy is available in searchable format to the public. Everywhere there’s a U.S. post, there’s a diplomatic scandal that will be revealed. It’s open diplomacy. World-wide anarchy in CSV format. It’s Climategate with a global scope, and breathtaking depth. It’s beautiful, and horrifying.” Those are the words of Bradley Manning, 22 years old, low level, in Iraq, coming in with his Lady Gaga CD, saying it was Lady Gaga, and downloading all this information. Is this possible? Dan Ellsberg, I want to put that question to you. You’ve been raising money for his defense. DANIEL ELLSBERG: Well, clearly, what’s possible to 22-year-old Manning, who was, by the way, seven years younger — I think probably 20 or so when he actually started this process — what’s available to him is probably available to 500,000 or 600,000 people, available to SIPRNet. And notice that the thing that first struck him was his realization that he was involved in the arrest process of people who he later discovered were doing nothing other than writing what he calls “scholarly critiques” of the current administration, for which they were being tortured by the Iraqis to whom we were turning them over, with the knowledge of Americans, all of this being blatantly illegal, both for the Iraqis and for the Americans who turned them over to torture. And when he reported this to his superior, his superior told him to forget it and get back to work arresting people. The effect that had on Bradley Manning was that he was being asked to participate in a blatantly illegal process, and he chose to say no to it, to expose it, to resist it, to do what he actually should have done. One person out of hundreds of thousands who did that. AMY GOODMAN: Do you think it’s possible — Dan, we only have five seconds. Do you think it’s possible he’s alone in releasing this information? DANIEL ELLSBERG: In terms of access to the information, he’s certainly not alone. In terms of ability to download it, not alone, although they have tightened up the procedures as a result of what they found about him and how he’s revealed how he did it. For that, perhaps, they can give him a medal for improving their security. AMY GOODMAN: We’re going to have to leave it there. I want to thank you all for being with us. Daniel Ellsberg, Pentagon Papers whistleblower; Carne Ross, former British diplomat; Greg Mitchell of The Nation; and As’ad AbuKhalil, California professor.